Designed by thinkTREE Architects & Partners, today's home is going to prove to you just how innovative and smart architecture can be. Container homes are often associated with cheaper architecture that is less stylish and modern than normal homes. However, this couldn't be further from the truth. While they are cheaper forms of architecture, container homes have tons of other advantages too! They are incredibly affordable, are put together much more quickly than traditional homes, easy to build, environmentally friendly, can be placed just about anywhere and can be designed according to your specifications. 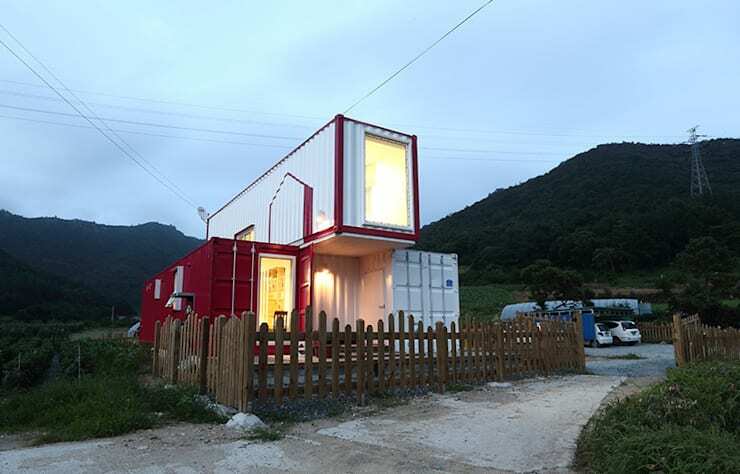 Let's go and explore what this particular container home looks like and just how attractive it really is. From this angle, we can see that the container home is a double-storey design with several different compartments, creating a very eclectic overall look. Have you ever seen something so unique and stylish? The designers have gone for a red and white theme, adding a little flair of personality and bold colour to the exterior of the home. This is always a great tip, even if you have a traditional home! Opt for brightly coloured shutters or window frames or paint your door a gorgeous, primary colour. We can also see that the designers have chosen a beautiful open piece of land to install this home on, allowing the inhabitants privacy along with panoramic views. This is the great thing about a container home! It doesn't need much space and it's easy to install it just about anywhere. From this angle, we can see how different this home looks from the exterior. Don't you think it looks like the top level of the home is sliding off of the bottom section? This goes to show how a container home truly allows you to have some fun! You can get creative and adventurous, designing the home exactly to your desires and needs. We can also see from here that there is a farm/farmhouse theme with the red and white colours contrasting dramatically with the lush green grass around this area. Check out this ideabook on: Can you actually live in a container house? 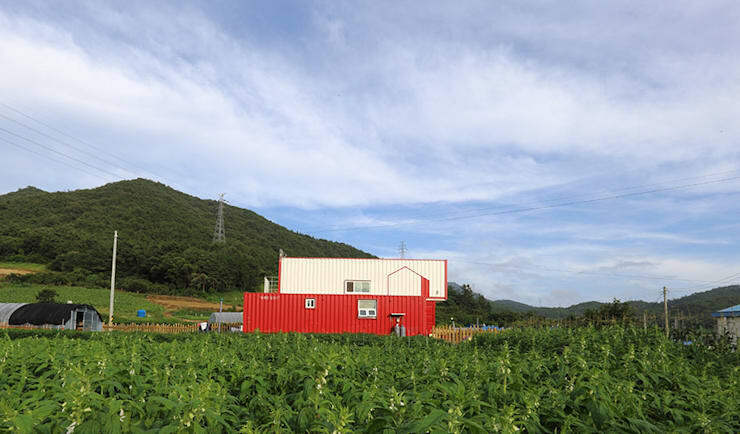 If we go inside this home, we can barely even tell that we are still in a container home. 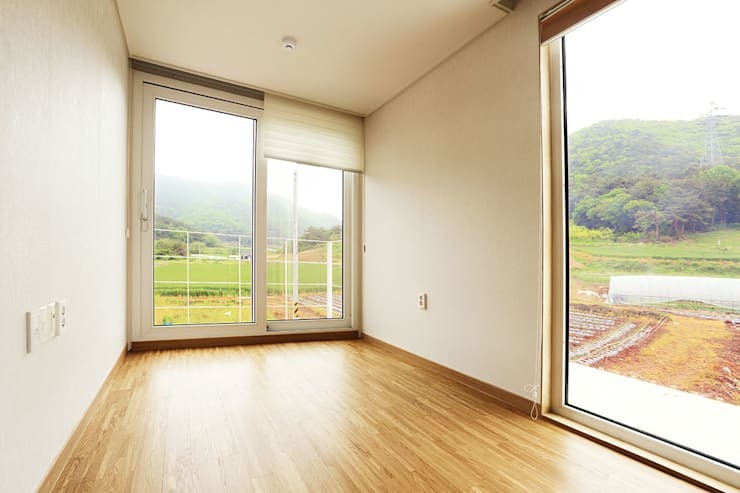 There is a large, spacious living room with light wooden floors and pale walls. This creates a very light and soft interior design. 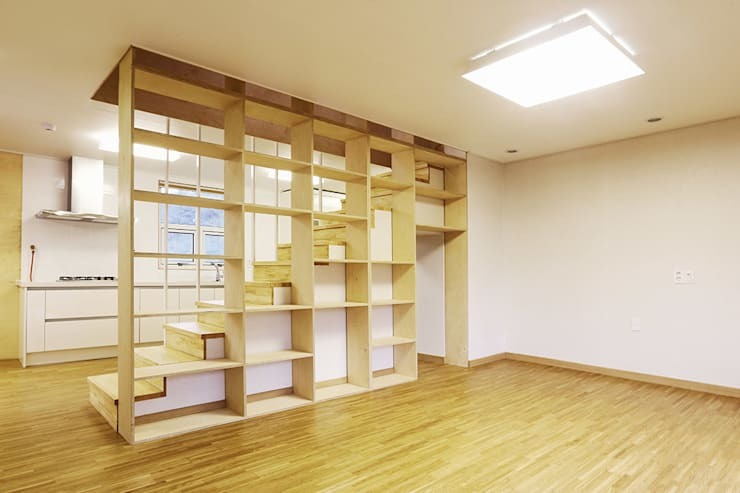 The designers have included a very intricate bookshelf across the side of this room, which also acts as a partition, separating the living area from the stairs and the kitchen. However, this home is still open plan, with each room spilling into the next. This is a very modern design, allowing for a home where the family can truly interact and engage. You'll notice that the light wooden floors extend throughout the living space into the kitchen. These keep a very uniform design that remains chic and trendy throughout the home. If we take a step back from the living room, we can see how impressive the bookshelf is, extending all the way up into the stairwell. This is a place where the inhabitants can place books, picture frames, ornaments, vases of flowers and decor accessories to really personalise and brighten up the space. On the other side of the stairs, there are several white wooden beams that extend up into the stairwell. These serve as a barrier so that those using the stairs don't fall off of them, but they also add a very trendy and edgy look to the interior space. We can also see that there is a large glass window on the one side of the living room, allowing lots of natural light to filter into the space. This is very important for a container home as you don't want it to feel too cold, dark or dingy inside! Have a look through the homify living room products for inspiration on how you would decorate your living room. 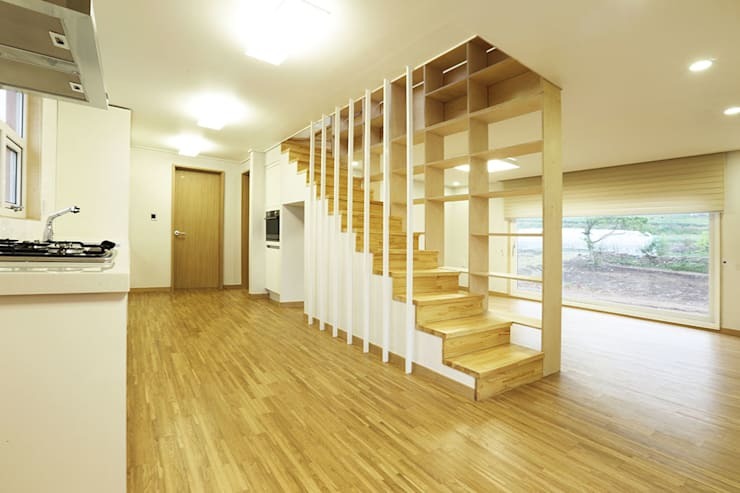 The corridor in this home is very simple and modern, with the wooden floors and pale walls that we have seen throughout the rest of the home. Here we can see how the book shelf truly extends up into the stairwell, so it can still be used on the second floor. How creative and innovative is this? The designers have only built one bookshelf and yet it can be utilised in many different spaces of the home. Again, we can also see how natural light plays such an extensive role. The designers have also included soft, dimming lights in the ceiling, however. These create ambiance and romance in the home when the sun is down! Have a look at these: Tips for decorating your stairway to heaven. We end off our tour in the beautiful bedroom, where large glass windows and doors give us views across the land. Would you still believe that you are in a container house? The interior of a container home can be just as impressive and just as stylish as a traditional, bricks and mortar home. The designers have chosen to include lots of windows and doors in this space, as well as a little balcony area. If you are going to be able to put your home down in some of the most beautiful parts of the world, you're going to want to see those parts! They've also included lovely light blinds, to offer the inhabitants privacy and shade if need be. This container home is proof of just how incredible, cosy, modern and innovative a container home can truly be. Would you live in a container home?